Jesse Rodriguez. Photo courtesy of the family. The shape of the intersection played a role in the hit-and-run crash that killed cyclist Jesse J. Rodriguez Sunday afternoon, according to a woman who was standing nearby with her bike and was almost struck herself. Police said Rodriguez, 67, was standing at the southeast corner of the Devon Avenue and McCormick Boulevard when the eastbound driver of a silver Dodge Charger struck him and fled east. Rodriguez, who lived in Rogers Park, was taken to Saint Francis Hospital, where he was pronounced dead. An autopsy the next day found that he had died of multiple injuries. A nearby business provided a security camera image of the damaged car to police, including its plate number, which ran in multiple news reports. The driver, a 15-year-old boy, turned himself in to the 20th District police station the next morning accompanied by a parent, according to the police. The teen has been charged with felony counts of reckless homicide, failure to report a crash, and leaving the scene of a crash. According to a post by Rodriguez’s friend Bill Nedza on The Chainlink social networking site, the arraignment took place today, and funeral arrangements were being made today. After Streetsblog reported on the case, a woman named Stephanie contacted me (she asked that we not run her last name) to say she witnessed the collision. A dental assistant and West Rogers Park resident, she said she had been biking north on the nearby North Shore Channel Trail after visiting the North Park Nature Center that afternoon. She saw Rodriguez cycling northbound on the trail on his black hybrid bike, and then they both stopped for a light at Devon, where cyclists are supposed to jog about 50 feet west of the trail to McCormick to use a crosswalk. They were both standing, holding their bikes, rather than straddling them, she recalled. Rodriguez was standing within the crosswalk a few inches in front of the curb cut; she was closer to a “Shared Lane: Yield to Bikes Sign” directed at drivers on Devon, which has faded bike-and-chevron shared-lane markings. 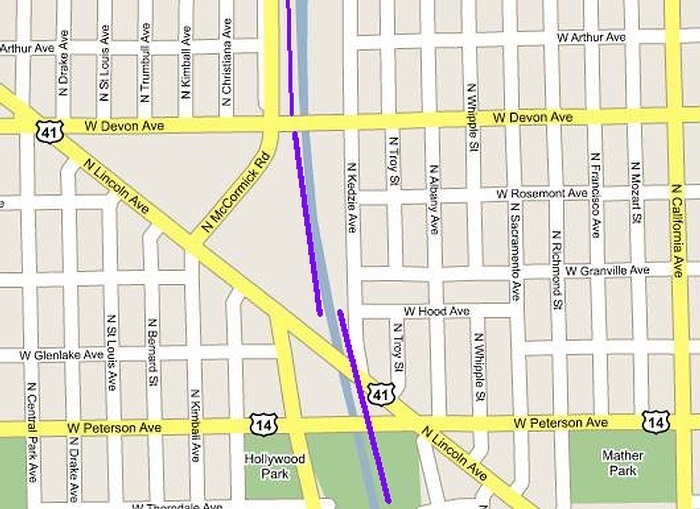 It was then that the teen, speeding driving north on McCormick, whipped around the southeast corner, Stephanie said. The corners of the intersection have a wide, rounded shape, rather than being right angles, which facilitates fast turns by motorists. She said she believe this contributed to the driver’s high rate of speed. McCormick also bends southwest from Devon, so the southeast corner is an obtuse angle, which also makes it easier for drivers to make fast turns. Thank you for your kind words! My uncle was a great man! My sympathy to the family and friends of Jesse Rodriguez. People turn off Lincoln and on to McCormick driving like bats out of hell. I live in the area and do my best to stay away. Also, something has to be done about the break in the bike path. This whole situation fosters accidents and injuries. The speeding problem in that area is dangerous for everyone. Is there something we can do to get CDOT to redesign this intersection to tame the speed of the motorists? This is right at the border of the City of Chicago and Lincolnwood. I wish your family the very best, Melissa. Such a tragedy. This is a very dangerous area for bicyclists. The path along the North Shore Channel going south ends on the west side of the Channel. The path going north ends on the east side. To join or continue to ride there are only two ways to cross the Channel: Lincoln Avenue on the south and Devon Avenue on the north. Both of these streets very unfriendly to bicycles – neither have bicycle lanes. What’s needed to improve the safety at this area: the construction of the “Stone Bridge” crossing the channel between Lincoln and Devon. This has been planned and scheduled for several years, there has been no objections from the alderman or neighbors, and funding has been made. Because that bridge hasn’t yet been constructed, I usually just use Kedzie north of Lincoln Ave, thus avoiding the intersection where the crash happened. It doesn’t help that the intersections along the Channel Trail have 3+ minute cycles, and only have crossing signs when the beg button is pushed. Drivers assume they have the right to turn constantly, and pedestrians either jaywalk or wait for a signal that never comes. When urban streets are designed to facilitate driving at unsafe speeds, deadly and life-changing crashes are a predictable outcome. Chicago has already seen more bike fatalities in 2018 and that the full-year averages for 2012-2016.